In Stephen King’s career he is well-known for the stories he has written, the films based on those stories and his bit parts in some of those films. At one point of his life, he decided to sit in the director’s chair and adapt one of his short stories. The experience of directing that film turned King off from ever directing again. 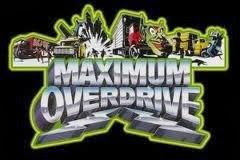 That film was Maximum Overdrive. When a mysterious comet interferes with Earth, the machines of the world come to life with a mission to kill all humans. A small group of people at a truck stop are held hostage by vicious 18-wheeler trucks. The group suffer from frustrations of being taunted and pushed around by these killers trucks all while never knowing if all the madness will come to an end. King has said that during the process of making this film he was “coked out of his mind” and he didn’t know what he was doing. It showed. Don’t get me wrong, I love Maximum Overdrive but it’s a bizarre little film that is unintentionally hilarious and super ridiculous. 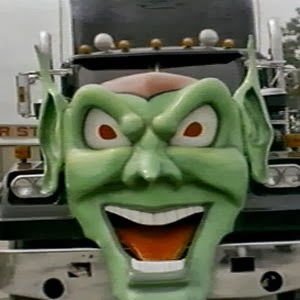 I know Maximum Overdrive isn’t a fan favorite for people who loves King’s work, but to think of him behind the camera, high on drugs and just winging it, kind of makes this movie great beyond the plot and creepy Demon Toy truck. i reading “trucks” in “night shift” and it was pretty good. i have never seen the movie and now i think i might have to check it out! thanks Nicki!